StingRay Parts Washers conserve water, reduce energy consumption and do not pollute the environment thus meeting the goals of GREEN TECHNOLOGY cleaning solutions. StingRay Parts Washers’ closed-loop, zero discharge system design means each parts load will be washed, rinsed and flash-dried with no solution or water being discharged outside the Parts Washer cabinet. The rinse water becomes makeup to replenish the solution that is lost through the evacuation of steam. Thus, the wash solution and rinse water are recycled again and again. Depending on the Parts Washer model, a StingRay Parts Washer will collect between 34 gallons and 1,100 gallons of sludge and other waste before cleaned out and recharge with fresh water and detergent. Sustainability - cleaning materials and components of new manufacturing and rebuilding without damaging or depleting natural resources. In short, meeting present needs without compromising the ability of future generations to meet their own needs. StingRay Washers reuse the wash solution many times eliminating the one-use cycle of many other cleaning methods. Recycling – ending the "cradle to grave" cycle of manufactured products, by providing an efficient and effective solution to remanufacturing so that products can be fully reclaimed or re-used. The Steel in a StingRay will be melted and reused to make new steel for other products once the washer ends its economic life in 20 to 25 years, the copper wire in the motors will be recycled and the machines have virtually no plastics that use oil, thus 98% of materials of machine can be reused. Source reduction - reducing waste and pollution by changing patterns of production and consumption. StingRay washers collect and concentrate the waste stream from parts cleaning. 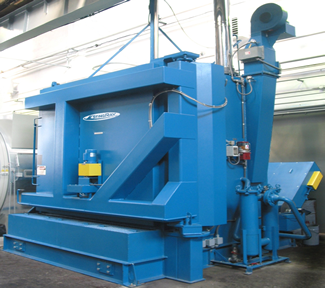 StingRay Parts Washer collects and concentrates waste oils and grease for recycling. Aqueous water based cleaning with Detergents is safer for the environment than using solvents that deplete oil resources. StingRay Parts Washer uses energy for cleaning rather than chemicals that go back in to the environment. Closed-loop – collects all wastes (oil, grease, road soil, heavy metals and carbon) for safe remediation.